Perhaps you’ve never thought of the many things that can settle into the carpeting in your home. Beyond simply dirt and dust, carpets can accumulate pet dander, mold spores, pesticides and dust mites. The problem is so serious that the Environmental Protection Agency has judged indoor air quality to be one of the top 5 greatest pollution dangers in the country. Of course, you want to keep your carpeting clean so it looks good and enhances your home, but indoor air quality is a major reason to keep your carpeting as clean as possible at all times. The very health of your family and any visitors is an added incentive to regularly vacuum your carpeting. A single, square-foot of carpeting can hold more than a pound of dust, dirt and allergens, according to carpet experts. However, an efficient vacuum machine and at least once weekly cleanings can make a huge difference. If you have a large family, regularly have many visitors or have young kids and pets, those are all reasons to vacuum the carpeting twice weekly. In addition, follow your carpet manufacturer’s recommendations for regular professional cleanings. These involve water-extraction machines that circulate water deeply into the carpeting and then remove it so that mildew is not a danger. According to the EPA, carpeting is a common source for volatile organic compounds, known as VOCs. A VOC is any substance that has carbon and can evaporate at room temperature. VOCs can trigger sinus pressure, headaches and irritation to the eyes, nose and throat. In addition to carpeting, VOCs are commonly seen in cosmetics, varnishes and dry cleaning products. Experts recommend building in at least a day or two into the schedule for moving into a home after new carpeting has been installed. Completely ventilate the rooms with the carpeting and much of the VOCs will dissipate. 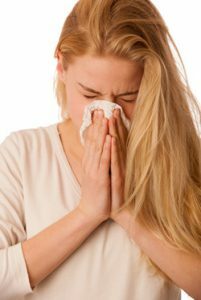 You probably have people in your family, or regular visitors, who suffer from allergies and asthma that can be made worse by allergens in dirty carpeting. Young children are particularly susceptible because they tend to play on the ground and get in close proximity to animal dander, pet mites and other toxins that can trigger allergy reactions and asthma episodes. In fact, according to the Asthma and Allergy Foundation of American, up to 1 out of 5 Americans is affected in some way by either condition. Monitor the health of anyone in your home with allergies or asthma and create a carpet cleaning schedule that minimizes any symptoms.